The tube light or fluorescent light is a low pressure mercury vapor gas discharge lamp and it uses fluorescent to produce white light. We need tube light, ballast, starter and fluorescent light holders to make wiring connection. 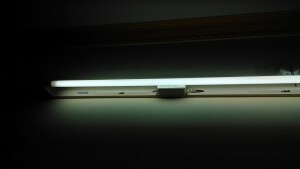 The fluorescent tube has two filaments with four terminals the starter is connected between two filaments, the ballast is connected between main Ac supply and one filament in tube light. Here another terminal in tube light is directly connected to the AC supply, to ionize the mercury atoms in the tube light starter element is used, after the ionization operation of starter is does not need for fluorescent lamp. 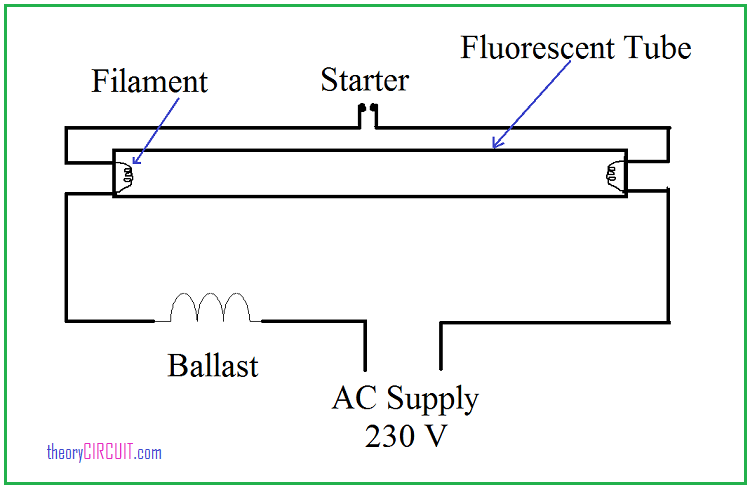 the ballast employed to convert the AC supply frequency to high frequency and the ballast regulates the supply given to the tube light. Starter or Glow starter placed parallel to the tube filament contains small neon lamp with fixed contact, bi metallic strip and small capacitor. The Starter Provides current flow path to the filament of tube at the initial time. It becomes inactive after the gas ionization and current flow in the tube. 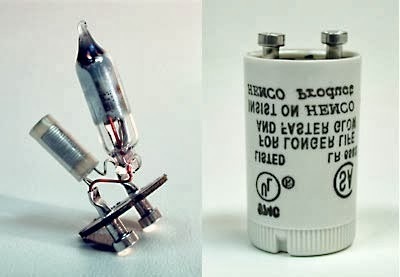 Tube light blinking occurs at starting because the Starter circuit tries to make current flow in the tube gas. Once the gas in tube ionized means then current flow occurs and tube will start continuous glowing. why the small lamp required inside the starter.if the small lamp removed from the starter what will happen. The purpose of the choke is to provide a very high voltage initially between the filaments (across the two ends of the tube light). Again once the gas in the tube is ionized the choke provides a low voltage. Initially when choke induced high voltage, is the same voltage in induced across the switch? If yes the n how switch withstand with high voltage?